Markets reacted cautiously after a provisional deal was reached on a third bailout deal for Greece. 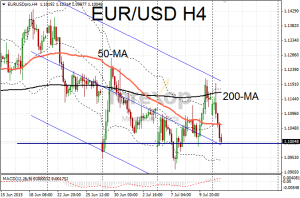 After rallying up to 1.1196 EUR/USD rebounded on technical resistance before any attempt at testing 1.12 could be made. 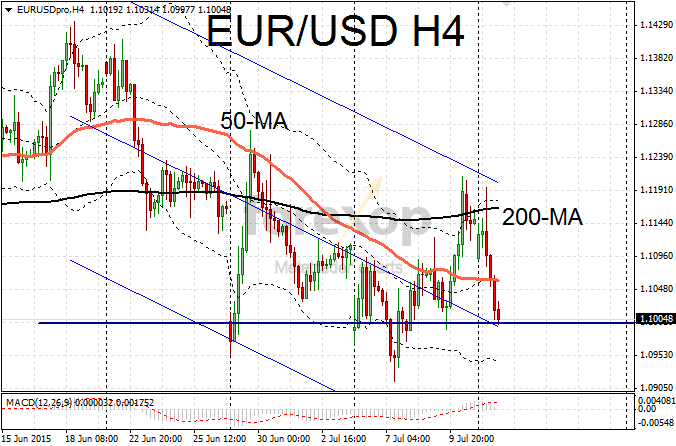 A strong selloff sent EUR/USD back down to 1.10 where a temporary floor was established. The euro was also trading down against the yen and against the British pound. EUR/GBP fell one percent to 0.7104. A weaker yen gave some support to EUR/JPY averting sharper losses. After touching an intraday high of 137.78 EUR/JPY fell back to 135.86. All nineteen leaders of the Eurozone finalized a deal on Monday that should allow Greece to remain in within the euro though not on its own terms. In order to go ahead a stringent set of reforms plans has to be ratified by the Greek government and parliament by next Wednesday. EU finance ministers demanded that this has to pass before they will even begin detailed negotiations on the third bailout. Greece will receive 86B euros over the next 3 years. The package also includes a trust fund of 50B euros that will be used to manage state privatizations and the proceeds. Half of the initial fund will be used to recapitalize Greek banks. To avert the immediate crisis there will also be a short term bridging loan provided by the ESM (European Stability Mechanism). In return Greece must pass through strict pension reforms, unify the VAT rate at 23%, curb trade unions powers, and embark on a mass privatization of state assets. EU leaders also demanded that Greece’s socialist government reverse its recent increases in public spending commitments, a policy that violated the conditions of the second bailout. Such is the disintegration of trust that the Greek parliament must also agree to external monitoring by IMF and EU officials to ensure that the measures are followed through. This was a red line for several leaders, including Germany and Finland. Doubts were raised over whether such a tough set of reforms would pass through the Greek parliament which is now dominated by extreme elements including socialists, marxists and anti-austerity proponents. Tsipras will likely need support from the moderate center right parties and could be forced to eject a number of his own ministers in order to pass the bill.